Inside this beautiful hardcover book you'll see what growing up was like during Josefina's times in 1824 New Mexico. Look inside a Pueblo Indian village, and welcome a trading caravan from Mexico. To her credit, the student is critically analyzing the ways in which the series portrays dolls of color, and is finding problems with those portrayals. 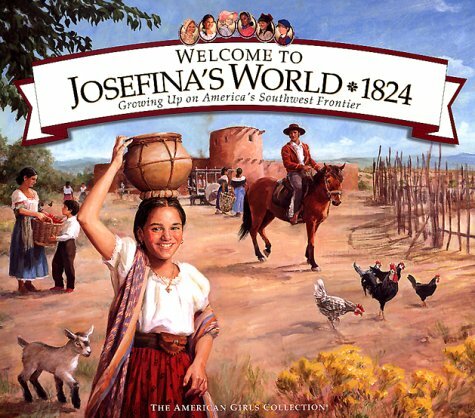 One page of Welcome to Josefina's World includes an old, black and white photograph of two Pueblo women. One woman is sitting in front of the other. The camera position is behind and to their left. The woman in back has her hands on the shoulders of the woman in front of her. It is not clear what they are doing, but the caption says that lice were a problem, and that these two women were likely removing lice from each other. Thanks, Fi, for bringing this book to class. Update: One of the other "Welcome to..." books (about Felicity, a white character) shows a lice comb as an artifact. I'm glad it is there, but I think that the two images are vastly different in what they convey and what they invoke in the reader. See comments below. Mel Gibson's film Apocalypto is about to be released. The previews promise a lot of action, and it looks like it features a lot of stereotypes, too, which means it'll probably do well at the box office. If you are interested in a critical review of Gibson's process of getting this film done, The Nation has one: Mad Mel and the Maya. In the midst of the media attention of this film, I learned of a children's book by acclaimed author Jon Scieszka. Titled Me Oh Maya, it is part of his Time Warp Trio series of books in which three boys time travel, mostly to the past, but occasionally to the future. Me Oh Maya was first published in 2003 by Viking. In Me Oh Maya the boys find themselves in a Mayan ball court. 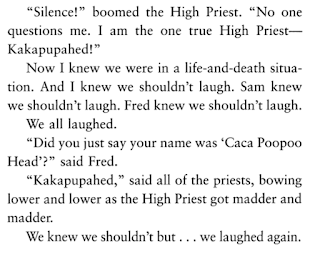 A "short brown-skinned guy in a wild feathered headdress stood on top of the wall looking down" at the boys and says to them "Explain yourselves or your blood will be spilled in sacrifice." This guy turns out to be an "evil high priest" stands over them. 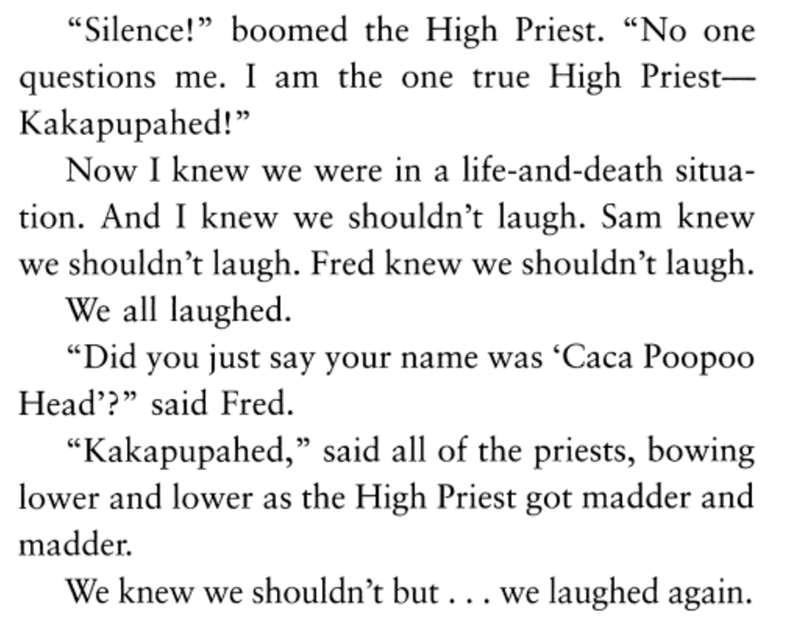 His name, they learn, is Kakapupahed. The Time Warp Trio series is pitched to kids who are "reluctant readers." This sort of book provides readers with clever writing that functions as a hook to draw in a kid who might otherwise not read. In this series, that hook is puns, lots of action, and, as the reviewer at School Library Journal notes, "a little bathroom humor." They struggle, unsuccessfully, to contain their laughter. This "evil priest" is corrupt, and with the help of one of his relatives and her son, they manage to trick him and remove him from his position. Reviews of the book say that kids can learn a lot about Mayan culture by reading this book. I don't think so. What they really learn is that it is perfectly fine to denigrate Mayan names and hence, the people who carry them. They learn that the Mayan's are fools who can be easily tricked ("primitive Indians" you know). Those are my initial observations. There is much more to say about flaws in Me Oh Maya. For now, I consider the context. A children's book. A feature length film. Both deeply flawed, yet those flaws escape notice. Why is that? 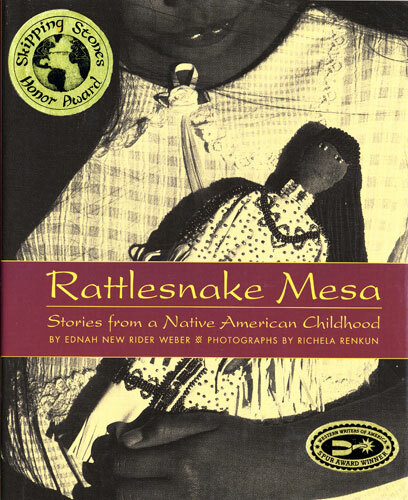 Rattlesnake Mesa is EdNah New Rider Weber’s recollections of growing up in the early 1900s. After the death of her grandmother, young EdNah is sent to live with her father at Crown Point Indian Agency on the Navajo reservation, and attend the Crown Point Indian School as a day student. Just as she is starting to feel at home, her sense of herself and the world is shattered when she witnesses some children being whipped. “I carried mortal shame, fear, and hurt away with me….I was just eight years old,” she writes. At the end of the school year, EdNah is uprooted once more and sent to the government-run Phoenix Indian School. Here, she finds rigid military discipline and the attempted eradication of everything she is. Despite the loneliness, despite the arbitrary punishment, there is more than a little subversiveness and outright rebellion—mocking the teachers behind their backs, underground games and songs. The children “learned early—laughing was best." EdNah New Rider Weber is an awesome storyteller; her words will bring young readers into her world. But several things about Rattlesnake Mesa are very, well, odd. For one thing, the voice shifts throughout the book from Weber’s conversational storytelling cadence to a strange, detached, “objective” outsider rhythm. This happens too often not to be noticed. In a piece about boarding school, Weber recounts how a little girl the students nicknamed “Old Thunder” had an “unbelievable talent—a natural ability to pass her stomach gases as she pleased. Complete control!” And in another section, there is an odd, outsider overemphasis on what people are wearing: “The Zuni women were richly clad in black mantas and white buckskin-wrapped moccasins. Navajo ladies wore velvet shirts, studded with old coins from the 1800s, and exquisite turquoise jewelry.” And there is an—odd—description of a ceremony that wouldn’t have happened quite that way. Another oddity is the black-and-white photos that illustrate the book. The endnotes say that in 1998 “[Weber and Renkun] set out to revisit the landscape of Weber’s childhood in New Mexico—searching for old memories and creating new images to recapture them….They searched for faces of children and elders who were part of the land, faces that helped Weber remember the people she had known in her youth.” It’s an interesting project for a photographer to visualize an elderly person’s stories. But there seems to be an unstated assumption that Weber had no memories until she saw these “faces of children and elders who were part of the land.” Otherwise, why would Renkun pose unhappy-looking children dressed in ‘50s-style clothing, to represent the boarding school experience? And what relevance is there for a shawl dancer, wearing moccasins, dancing alone, on hard rocky ground? Questions remain: Why was it seen as necessary for Weber’s evocative recollections of her childhood to be contaminated with Renkun’s new-agey photographs and perhaps someone else’s writing? Why does Renkun, her husband and her son have wannabe-sounding Lakota names? And why does Renkun dedicate the book to her “Uncle Pete Rock (Che Nodin) full-blood Obijwa [sic], naval commander, athlete, and alumnus of the Carlisle Indian School (1918-1990)”? Carlisle was in operation from 1879-1918. The audience for LeBeau's Rethinking Michigan Indian History is teachers. The material in the book will be helpful to teachers in grades 4-12 who seek to provide students with balanced instruction about Native peoples of Michigan. Stereotypical representations of Michigan's Indians are what most people of Michigan understand and recognize. The U.S. Constitution protects and upholds Michigan Indian treaty rights. Michigan's Indians are alive and well in the modern world and are not artifacts of the past. Michigan's Indians change and adapt to circumstances and events; therefore, they are not frozen in any one image or time period. Material in the book is teacher-friendly. "Objectives" are listed at the beginning of each lesson, followed by a narrative about the lesson topic, and then a set of Activities. Each lesson includes color illustrations, maps, charts and examples of student drawings. All of this material is also available on the accompanying CD-ROM. Lessons can be used as stand-alone units, and have application in other states (not just Michigan). LeBeau is an enrolled member of the Cheyenne River Sioux Indian Reservation in South Dakota and is the former director of Michigan State University's American Indian Studies Program.